Temperatures have been unusually cold, with severe snowstorms impacting North America and Europe this winter. Further north in the Arctic, it has been unusually warm. 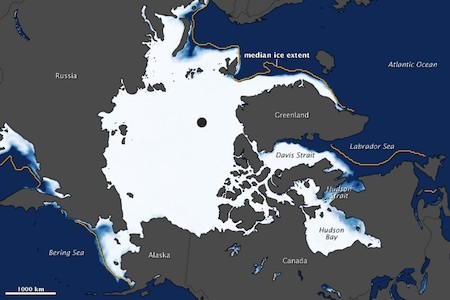 The U.S. National Snow and Ice Data Center has reported that Arctic sea ice was at its lowest ever recorded for January, since satellite records began. The above image shows the average Arctic sea ice concentration for January 2011, from a NASA satellite. The blue areas show open water and the white areas show high sea ice concentrations. The turquoise areas indicate loosely packed sea ice. The yellow line shows the average sea ice extent for January from 1979 to 2000. Some normally frozen areas didn’t completely freeze unit mid-January. The Labrador Sea was unusually lacking in ice. Climate Progress has a good analysis of what is going on here – with the cold temperatures and stormy weather in the Northeast U.S. and Europe, and unusually warm temperatures further north. NASA image created by Jesse Allen, using AMSR-E data and sea ice extent contours, courtesy of the National Snow and Ice Data Center (NSIDC).